WH Slade & Co was a small glove manufacturing company started by William Henry Slade who was born on 28 August 1892 in New Town, the son of leather parer William Alfred Slade (1863-1937) and Martha née Wright (b1859). William and Martha were listed in the 1901 census living at 5 Kiddles Lane (today's Eastland Road) with their children; Lucy Jane (b1886), Bertha Ada, known as Ada (b1888), Gertrude Mabel, known as Mabel (b1890), 8-year old William and Herbert Alfred Ernest (b1899). By the time of the 1911 census William and Martha had moved to 84 St Michael's Avenue and were listed there with their children. William Snr was listed as a leather parer, the three daughters were all leather glove machinists and 18-year old William Jnr was a leather glove cutter. In the autumn of 1917 he married dressmaker Winifred Bessie Goff (1892-1974) at Yeovil. They were to have two sons. Many thanks to William and Winifred's granddaughter, Hazel Dickinson, for the following - "In addition to running the business, my grandparents were committed members of the Salvation Army. My grandfather played in the Yeovil Corps band (I believe his instrument was the euphonium), and my grandmother always seemed to be busy preparing for bring-and-buy sales (she was an inveterate jam-maker, as well as a gifted needlewoman). She might also have been a Songster, as she too was very musical." It would appear that WH Slade & Co, glove manufacturers, was started just after their marriage as the earliest mention of the company I found was in 1918 when the they advertised in the Western Gazette for Pique and PXM makers at the company's address 84 St Michael's Avenue (William's parents' home). Hand makers for chamois gloves were advertised in the Wanted advertisements in 1919. 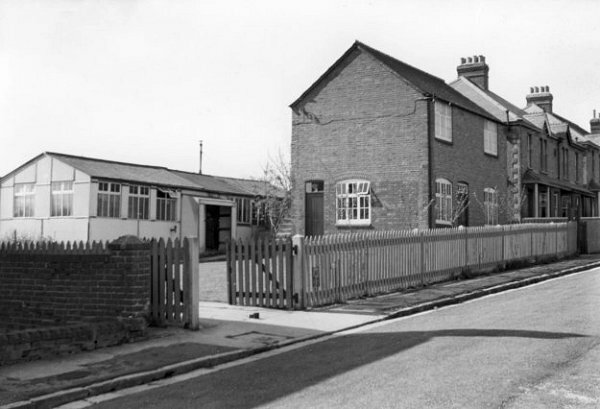 The small factory was, in fact, at the bottom of William and Winifred's back garden in Glenville Road and the site of the factory is now the car park of Roman Court. 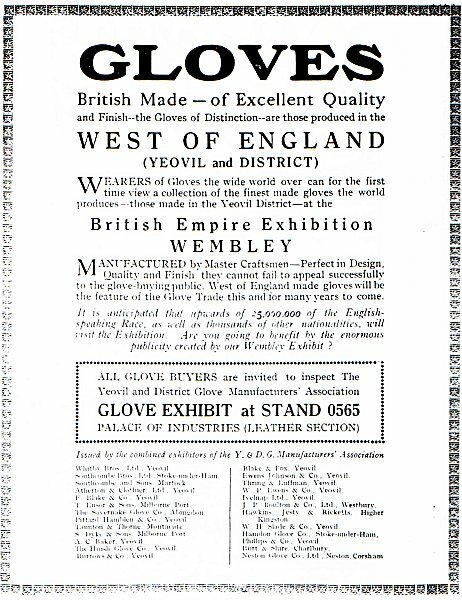 An advertisement of 1924, shown below, in which WH Slade & Co's range of goods was listed and the fact that they were to attend the Gloves Exhibit at the British Empire Exhibition of 1926 at Wembley, London. 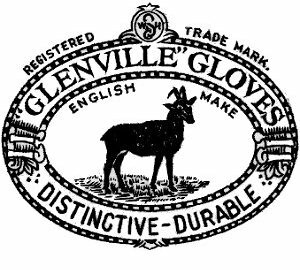 The logo of the company's "Glenville Gloves", above, featured a goat - the source of their product. The company placed a huge number of advertisements in the local press seeking workers, especially glove cutters, pique and Prixseam makers and Brosser makers from the end of the 1920s onwards, but most especially during the Second World War when there was obviously a severe shortage of skilled and unskilled workers. WH Slade & Co was first listed in a trade directory in Kelly's Directory of 1935. It was also listed in Edwin Snell's Directory of 1954 and Foord's Directory of 1964. It was listed in Kelly's Directories of 1968 and 1970, with a final listing in Kelly's edition of 1974. William Slade died in 1959 and the company was sold to Gordon Parsons and his partner Dennis Cook. Parsons and Cook had originally set up as glove cutters in Earle Street before buying Slade's business. 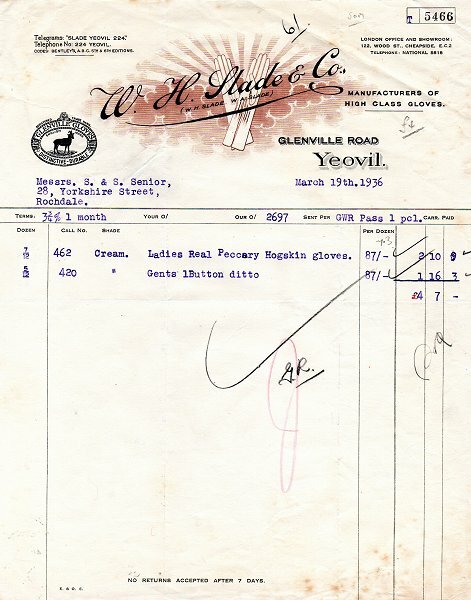 They set up the Glenville Glove Co Ltd to run in tandem with WH Slade & Co, apparently in the late 1960s. There is no mention of this company in the press and Kelly's Directories list them as "Glove Manufacturers of Glenville Road" only between 1968 and 1974. The two companies were still in existence in 1974 but no mention occurs in newspapers or trade directories thereafter. The glove factory of WH Slade & Co, later the Glenville Glove Company, in Glenville Road. The site is now the Roman Court flats. A full page advertisement from the June 1924 edition of "The Glover" listing those local companies taking part in the British Empire Exhibition at Wembley - including WH Slade & Co.
An advertisement for WH Slade & Co in "Branded Goods" published in 1926. Note the logo "Glenville Gloves" featuring a goat - the source of their product. 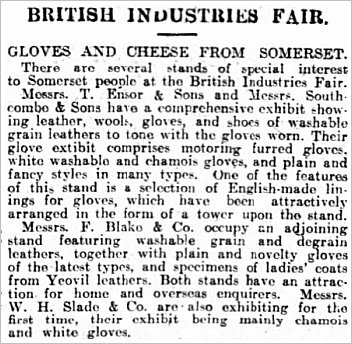 A report from the Taunton Courier's edition of 29 February 1928 noting WH Slade & Co's first appearance at the British Industries Fair, exhibiting mainly chamois and white gloves. 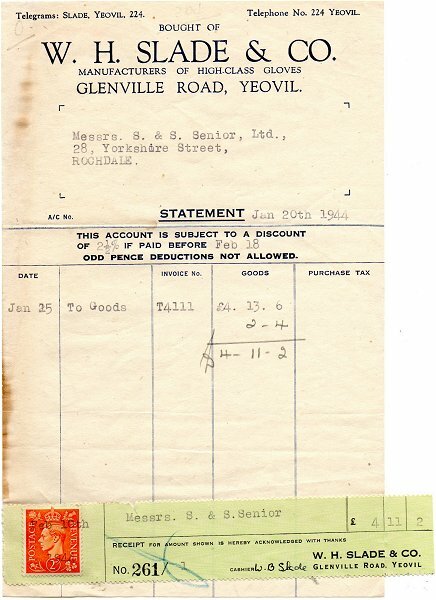 An invoice of 1936 with a really nice letter heading. A Statement, with a less flamboyant letter heading, issued in January 1944 by WH Slade & Co. Nice to see that they were still dealing with the same customer as in 1936.